Members of the Northeastern Jurisdiction Committee (NEJC) on Native American Ministries of the United Methodist Church expressed their solidarity with Native American tribe in Standing Rock, North Dakota. The tribe’s reservation stands near a site occupied by hundreds of supporters who have joined the Native Americans in protesting Energy Transfer’s $3.78 billion, 1,172 mile-long crude oil Dakota Access Pipeline. The protest population has swelled to as many as 7,000 in recent weeks, spawning an unprecedented movement. Set to run from North Dakota to Illinois, the pipeline comes within close range of the Standing Rock homes, raising concerns over the potential for a spill that could threaten land and water, including the nearby Missouri River. The pipeline would also trespass on what the regional Native Americans consider to be sacred tribal sites. NEJC Committee members drafted and signed a letter to Standing Rock Sioux Tribal Council Chairman David Archambault, to show their solidarity in opposition to the pipeline’s construction. Among several others, the letter was signed by GNJ’s Cyndi Kent, Chair of the Board of Church and Society and Chair of The NEJ Native American Ministries Committee . The letter closed with a prayer that God would encourage, uplift, and empower Archambault. The pipeline was originally set to have gone north of Bismarck, but after the city’s leaders complained, it was re-routed south to Standing Rock. “The same concerns, when they were expressed by the Native American people, did not carry nearly the same power,” said Rev. David Swinton, pastor of Grace UMC in Des Moines, IA, who recently traveled to the protest site. Native Americans from across the continent along with thousands of other supporters, have flocked to a series of encampments along the Cannonball River. The protesters gather adjacent to the Standing Rock Reservation on lands now controlled by the Army Corps of Engineers. 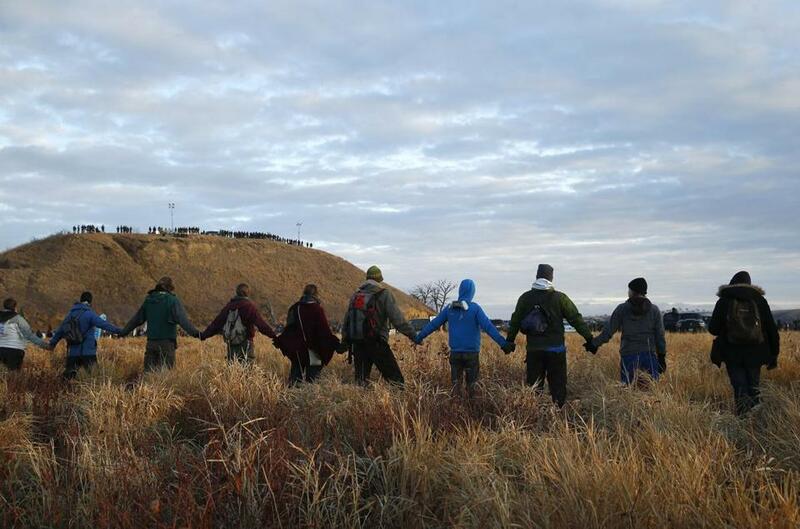 The land was awarded to the Dakota and Lakota peoples in an 1851 treaty, and then taken away. The Standing Rock tribe has attempted to block the pipeline’s construction in federal court but was denied by an appeals court in Washington on Oct. 9. Since then, construction resumed despite a request from the Obama administration for a voluntary halt. In recent days, the encampment spaces have become dangerous, with protesters injured by rubber bullets and concussion grenades, and targeted with high-pressure water cannons in sub-freezing temperatures while praying. The NEJC on Native American Ministries of the United Methodist Church remain committed to public support of Standing Rock and steadfast prayer.